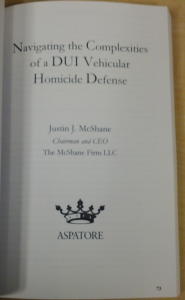 PA DUI Attorney Justin McShane authors another publication about DUI defense. One of the things I really love to do is share my research and knowledge with other lawyers to help them defend their clients. The defense of justice shouldn’t be limited to just Pennsylvania. Part of this commitment is authoring works on complex legal and scientific subjects. Recently a new publication was released: Defending DUI Vehicular Homicide Cases, 2012 ed. : Leading Lawyers on Understanding DUI Cases, Developing a Thorough Defense, and Negotiating Settlements in which I authored a chapter entitled: Navigating the Complexities of a DUI Vehicular Homicide Defense. You can view a complete list of my publications: http://www.themcshanefirm.com/attorneys/mcshane/. Once again, this is an honor that recognizes my hard-work and expertise in the field of DUI defense. For a free consultation with a qualified expert Pennsylvania DUI lawyer please call 1-866-MCSHANE.